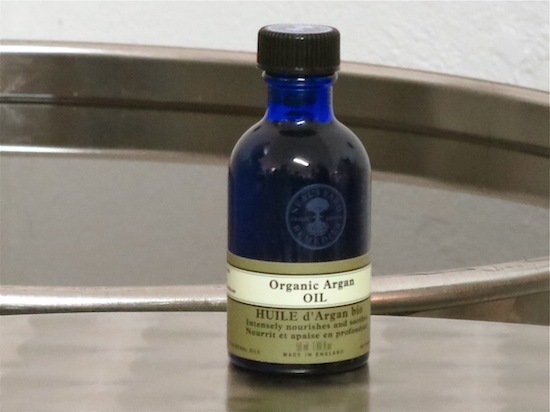 I loved this Argan Oil from Neal’s Yard Remedies from the very first use – it was something of an overnight miracle worker – but this week I’ve been on a bit of a special press trip with the brand and I have to say that, after what I’ve seen, I couldn’t love the product even a tiny bit more. My love is maxed out. Not only is the oil quite a potent little skin treat, Neal’s Yard Remedies have gone to great lengths to make sure that their sourcing is completely responsible and ethical. It has been quite a privilege to be taken on a provenance trip with the brand to be able to see exactly where this precious oil comes from and witness the process that turns a raw ingredient into something that can be used as a beauty product. 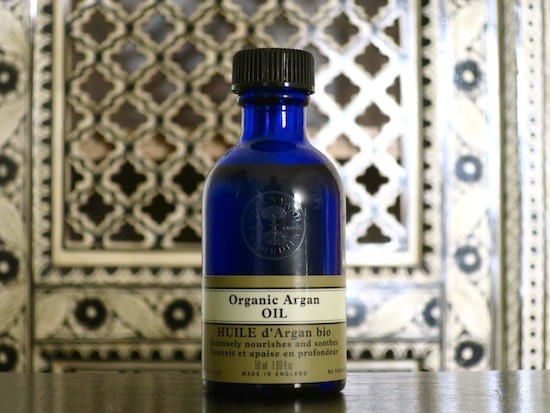 Argan Oil has been a bit of a beauty buzz-word for a few years now, but in all honestly I have tried to stay clear of featuring quite a lot of the products that claim to contain it. Mostly because the majority of them contain so very little (and we are talking miniscule, miniscule amounts) that it’s almost laughable. And they stick the word “Argan” on the bottle and people buy it because it contains that very expensive holy grail ingredient that will transform hair and nails and skin… I’m not by any means tarring all brands with the same brush here – there are some who are selling absolutely gorgeous beauty products containing high percentages of Argan and not even really shouting from the rooftops about it – and neither am I completely naive. 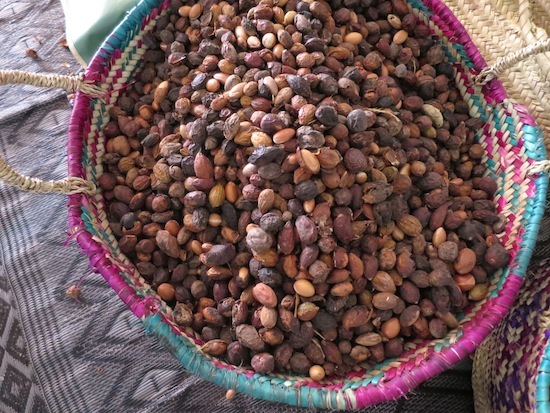 I know that beauty has it’s marketing smoke screens and that there are loads of ingredients that are touted about in a completely misleading way… I just suppose that it has been the Argan Oil issue that has irritated me the most, in the recent past. Anyway – mini-rant over, because I would much prefer to spend my energy championing brands who are transparent about their Argan Oil than bemoaning those who aren’t, and Neal’s Yard Remedies (you can see their Argan Oil here) is definitely one of the brands to be championed. Not only is their Argan Oil 100% “what it says on the tin”, Neal’s Yard have sourced their Argan from the only Fairtrade-certified Argan producing co-operative in the world. I went to the village of Tighanimine near Agadir to see exactly how the oil was extracted and it really was a tiny outfit – yes, some machinery, but mostly the work was done by hand. And all women. The Tighanimine co-operative was set up with the specific intention of providing work for women who wanted to work (though there’s still very much an issue surrounding this, as many of the women in the village want to work but are prevented from doing so by their husbands/fathers/brothers) and allowing them independent means. 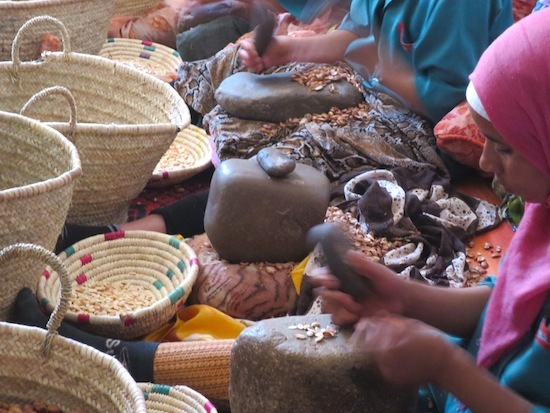 It was very forward thinking of them to form a co-operative – in fact they were the first Argan co-operative to be formed – and so was the decision to become certified Fairtrade. The co-operative actually have to invest quite heavily in order to be involved with Fairtrade, and the rewards aren’t by any means instant. It was apparent, as we spoke to the president of the co-operative, that Neal’s Yard Remedies’ decision to order their Fairtrade Argan (which costs NYR more than if they were to simply buy organic as they have to pay a Fairtrade premium on top of the usual invoice) came at just the right time. 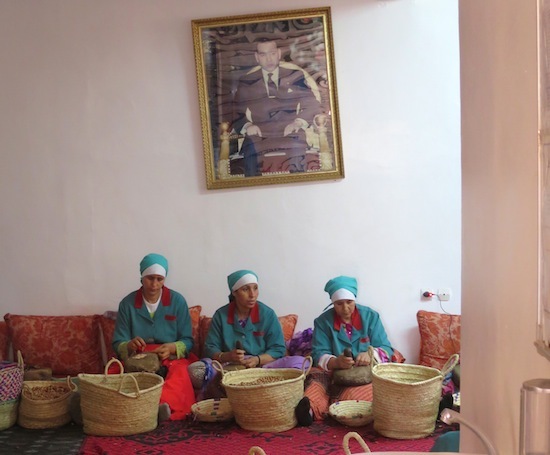 The co-operative at Tighanimine consists of sixty-eight Berber women, many of whom were there when we visited, cracking Argan nuts in the downstairs room. The women’s hours are flexible – they can work as little or as much as they want to – and they are paid by produce weight. The more nuts they crack, the more money they make. 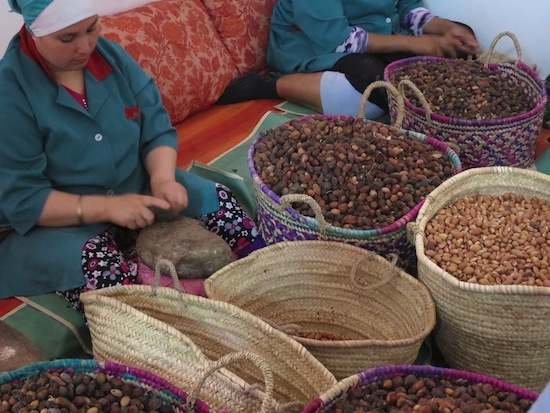 It’s quite a labour-intensive process, making Argan oil; the Argan nut has to be taken from the dried Argan fruit and then the kernel has to be bashed out from the nut. All of this is done by hand (I gather that most of the large, industrial outfits use machinery for this part) and there’s a lot of stone-bashing going on, but also a LOT of singing. The women sang almost constantly, and when they didn’t there was just the loud popping away of Argan nuts being split and the thumping of the stones. What most struck me about the co-operative was that the women were a proper community. Not surprising, I suppose, considering that they were all from the same small village; but there was a fierce sense of female friendship and affection between them all. And I was sceptical about the smiles and the singing and the laughing at first – the cynic in me, shamefully, considered the idea that maybe they were putting on a “show” for their visitors – but then it occurred to me that it is such a massive deal for these women to be working together and making money. Their own money. 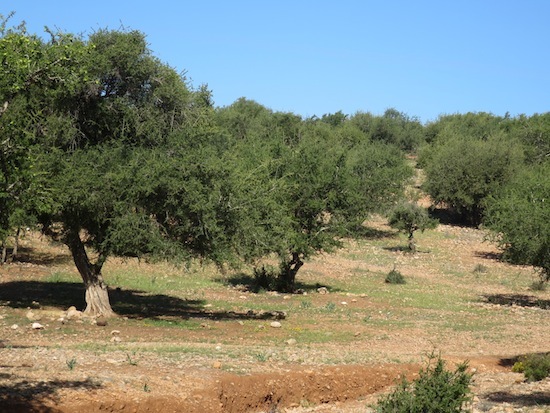 One of the supervisors, Fatima, said “in the countryside there would be no other work without Argan. 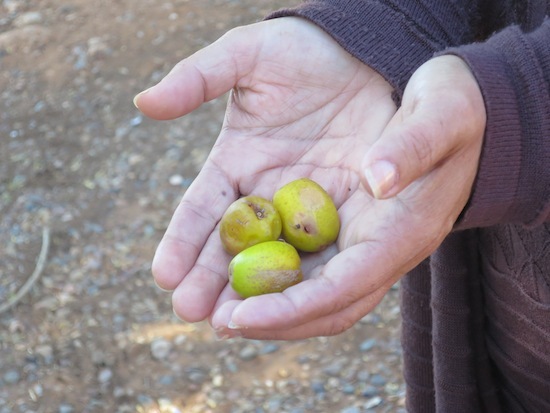 In the city you could do cleaning, but there would not be anything else here.” In her family it had been traditional to make Argan Oil for generations, but now the women of the village are making money from it. I digress, because this was supposed to really be a little rave about the actual Argan Oil product – pure, undiluted, impeccably sourced. I worry with many oils, that they’ll clog my skin or break me out (many seem to, especially when there are lots of other ingredients added) but this just worked small miracles overnight, leaving me with very plump and glowing skin in the morning. For those who want an oil but don’t want any essential oils blended in – this one’s for you. It’s also for anyone who simply wants a super-oil; Argan is so rich in fatty acids (I think over 80%?) that it’s amazingly nourishing for your skin, hair and nails, and it’s also very high in the anti-oxidant Vitamin E. Vitamin E is used to prevent scarring so Argan’s a beautiful treatment oil if you’re trying to get rid of fresh acne marks. As Argan is so light (and also anti-inflammatory) it won’t sit heavily on your skin and encourage new spots, either. Overall, then, pretty marvellous stuff. I have been using this as an overnight treat, but you could easily use a little before moisturiser day and night, massaging it in for an extra glowy boost. I’ve also tried it as a pre-shampoo conditioner, rubbing it into the dry ends of my hair and leaving it on for a few hours. It left my hair very silky – I didn’t actually need to use a conditioner, which rarely happens. It’s a great little oil to have about; uncomplicated, very simple, but highly potent as a nourishing skin and hair treatment. And the cost of this wondrous bottle of delights? A pleasantly surprising £17.50 – find it online here.